UPDATE: Since this interview, James Wicks has resigned from Tarim. The band plans to forge ahead. 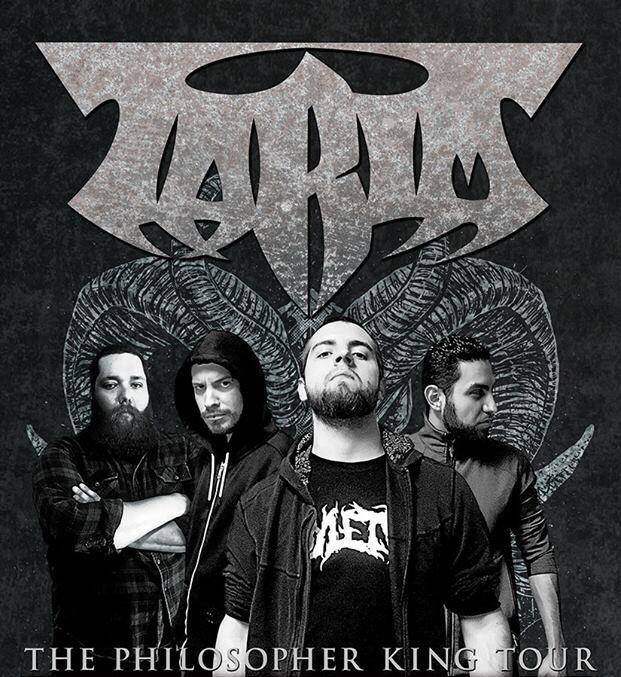 Melodic death metal band, Tarim, from the Dallas area, have impressed me as the intellectual type of band. Clearly they are doing it right, as their reputation is spreading like fire. X: Tarim was formed in 2011, but it sounds like you’ve been playing for years. What were you all doing before? James: Before we formed Tarim, Julio, Matt and I were in another band called Urizen for years (Julio is still a part of that band). We played well together and liked the same kind of extreme music, so we decided to start another project. 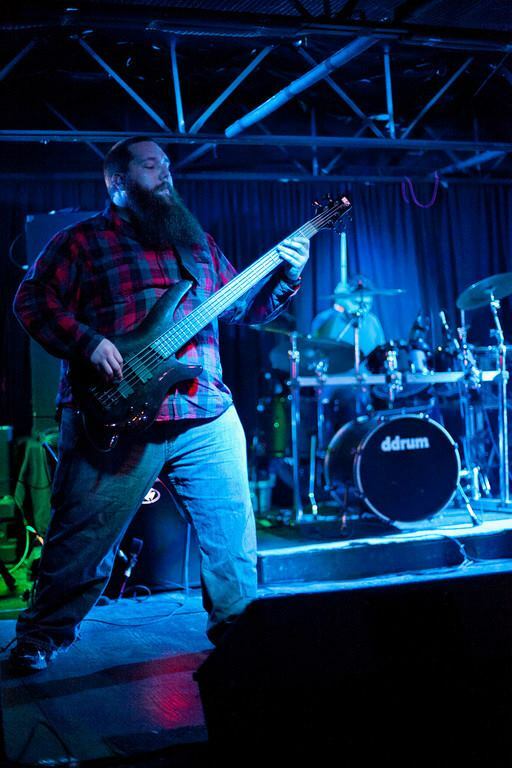 Before joining Tarim Geoff was playing in a DFW-based metal band called Bear Witness. He saw us playing as a three-piece with no bassist and liked what we were about, and we thought he would be a good fit. 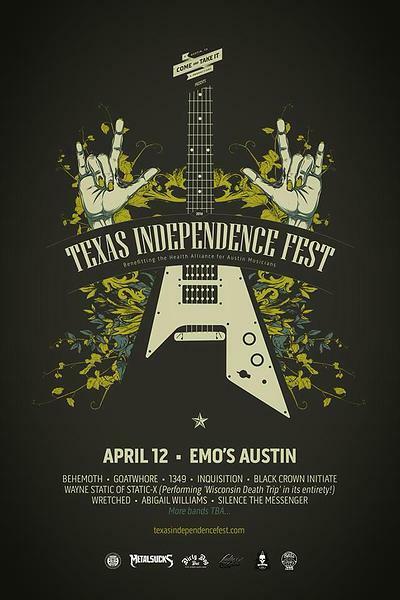 X: You won the Battle for Texas Independence Festival in Austin and returned for the actual event on April 12th to play with Goatwhore, 1349, Behemoth, etc. What was the best part of that experience? James: We had lots of great experiences playing the battle for TXIF, and playing the actual festival. First, Come and Take It Productions is hands down the best promotional company we’ve ever worked with, in Austin or anywhere else. Anthony was really accommodating, and he made sure that we were well taken care of. It was also great getting to meet guys like HeadCrusher, really talented and awesome people. As for the festival itself, it felt great to play on such a large stage and in such a large venue. And of course, it’s amazing to share the stage with bands like Behemoth, Goatwhore, 1349, Black Crown Initiate and Wayne Static; bands that we’ve always seen from the fan’s point of view, but never from the performer’s point of view. X: Your new album, The Philosopher King, was independently released last summer. What can you say about the process and are you already working on another? James: Well, “The Philosopher King” was entirely self-produced, so it was very challenging. It took us a long time to make a product that we all liked and that we thought was competitive for the genre. We definitely learned a lot since we had virtually no outside help, and that will definitely come in handy for future albums. Even though it’s still very much in its conceptual stages, another album is in the works. X: In this day of digital downloads Tarim fans come from beyond the DFW. Where do you feel the demand would be for the next tour? James: With regard to touring we still have a lot of ground to cover in the states. We would especially like to cover the coasts since we’ve mainly played the central states so far. However we also have lots of international aspirations, particularly Europe, Japan and Mexico. 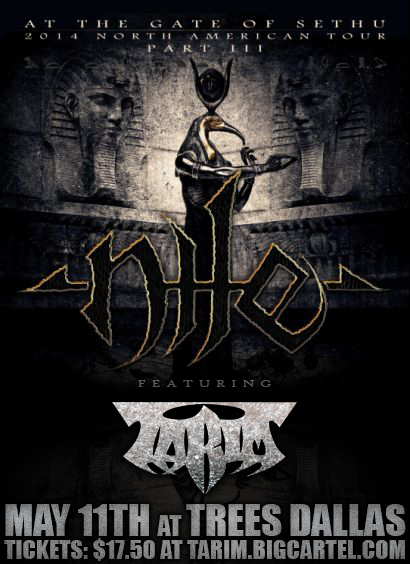 X: You play with Nile, May 11th in Dallas. How did this unfold? James: We were lucky enough to open for them on their tour in support of “At the Gate of Sethu” last year, and we’re excited to get the opportunity again. We are all huge Nile fans, and this time we are direct support so this show really means a lot to us. X: Is the name Tarim derived from the mummies found in the Chinese river, the fictitious god, or the city in South Yemen? Please explain. James: The name actually comes from a graphic novel series called Cerebus, a parody book featuring a barbarian aardvark. Tarim is the deity worshiped by Cerebus. We went with it to pay homage to the creator of the series, Dave Sim, but also because it just sounds cool. 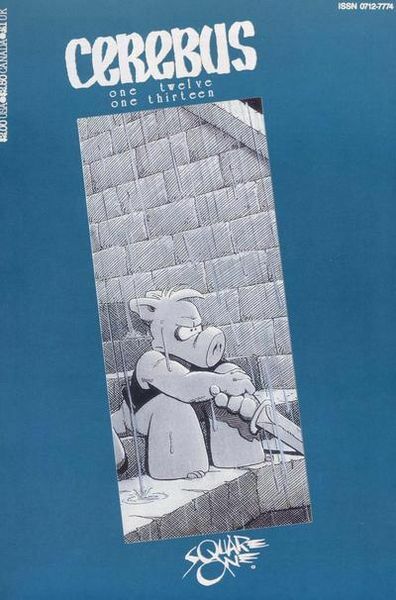 Cover to Cerebus issues 112 and 113, from 1988. Art by Dave Sim and Gerhard. X: It’s evident that you place an importance on deep and meaningful lyrics, especially with your lyric video out now for Rabble. Who writes the lyrics and what is the message? James: I write all the lyrics. There isn’t a specific message so much as there is an emphasis on certain themes like alienation and voluntary isolation, the absurdity of life, and dealing with emotional turmoil in positive and constructive ways. The implication is that lyrical substance enriches the musical experience, and we hope that fans of our music agree. X: The new bassist seems like an integral part of the band. Were you always looking for a bassist or was there a day that it suddenly dawned on you that there should be one? James: We were happy being a bassless three-piece for a little while, but after we heard Geoff play through the songs we really couldn’t go back. He added a lot of depth the album and we’d be doing our fans a disservice if we continued without that dimension. 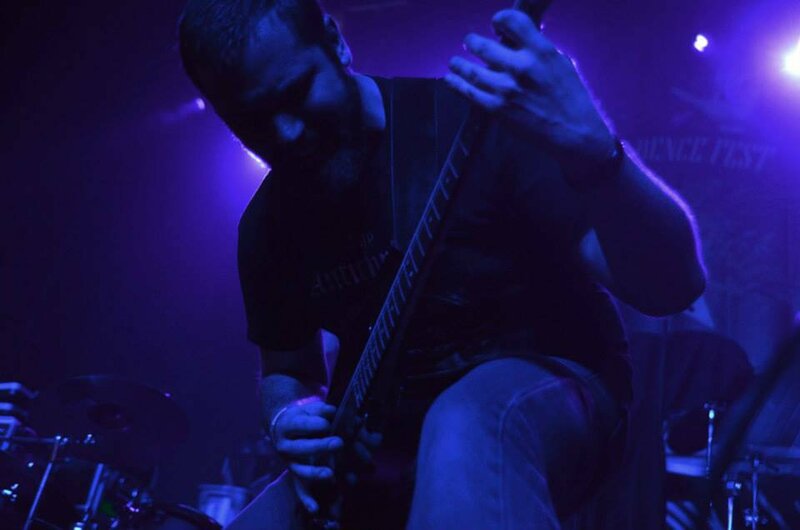 This entry was posted in Interview and tagged 1349, Anthony Stevenson, Bear Witness, Behemoth, Black Crown Initiate, Cerebus, Come and Take It Productions, Dave Sim, Goatwhore, nile, Tarim, Texas Independence Festival, Urizen, Wayne Static. Bookmark the permalink.